The terms concrete and cement are commonly interchanged when describing a solid surface made from these substances. If your neighbors need a new patio, whether they tell you it’s going to be made of cement, or they call it a concrete patio, your vision of the finished product may be the same. You understand that they are getting a patio in a pourable form that will harden and become a stone-like material. In actuality, however, your neighbors are strictly putting in a concrete patio, because there is a huge difference between concrete and cement. As mentioned in our article on “How Cement is Made,” concrete is not cement. Concrete contains cement. For example, if your neighbor installed a driveway made out of 100% cement, they would soon be parking at your place, because that driveway would not last long. 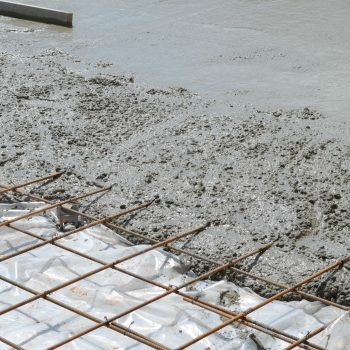 Cement needs reinforcement to have the strength of concrete. Therefore, concrete is a combination of materials that create a long-lasting product. Commonly, concrete is made of up to 8% air, 7-15% Portland cement, 14-21% water and 60-75% aggregates. The ratio is critical to the hardiness of the finished concrete. The mix of the aggregates, and the ratio of the individual components, can be adjusted to meet the expected use of the concrete and the temperature and weather when it is poured and finished. Aggregates are gravel or crushed stone. This ingredient is essential to give concrete strength and durability. Without the proper amount or variation of aggregate sizes, the dried concrete would crack easily and not be able to support much weight. For decorative concrete, pebbles are often used as the aggregate. Portland cement is not a brand name, but a generic term for a powdery, manufactured substance consisting of limestone, clay, gypsum, and other trace ingredients. Portland cement is relatively inexpensive to produce and is one of the most versatile construction products in the world. Water chemically combines with elements in the cement to create calcium silicate hydrate. This gel-like substance is what binds all of the components of concrete together. With too much water the concrete lacks strength. Add too little and it does not flow properly, dries too quickly and is difficult to shape. When you mix cement, water and aggregates to make concrete, the proportions are thus essential, even for a simple backyard project. For massive endeavors such as skyscrapers, dams and public works, the stakes are high and lives depend on the durability and longevity of the final product. 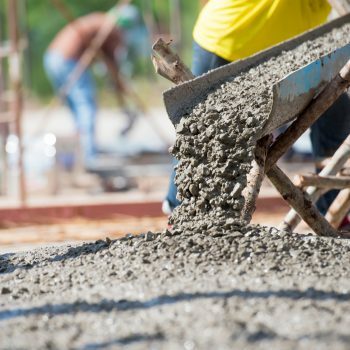 When mixed, formed, poured and leveled properly, concrete is as strong as stone and adaptable for many purposes. Concrete is literally the rock-hard foundation of modern construction. So if your neighbor asks you to comment on their new cement patio, you can tell them in “concrete” terms that it looks great, but that they are using the wrong word. That correction should hopefully “cement” a good bond between you. And if they want their patio to look even better, recommend California Custom Coatings to provide an epoxy coating that will further strengthen, beautify and preserve their investment.